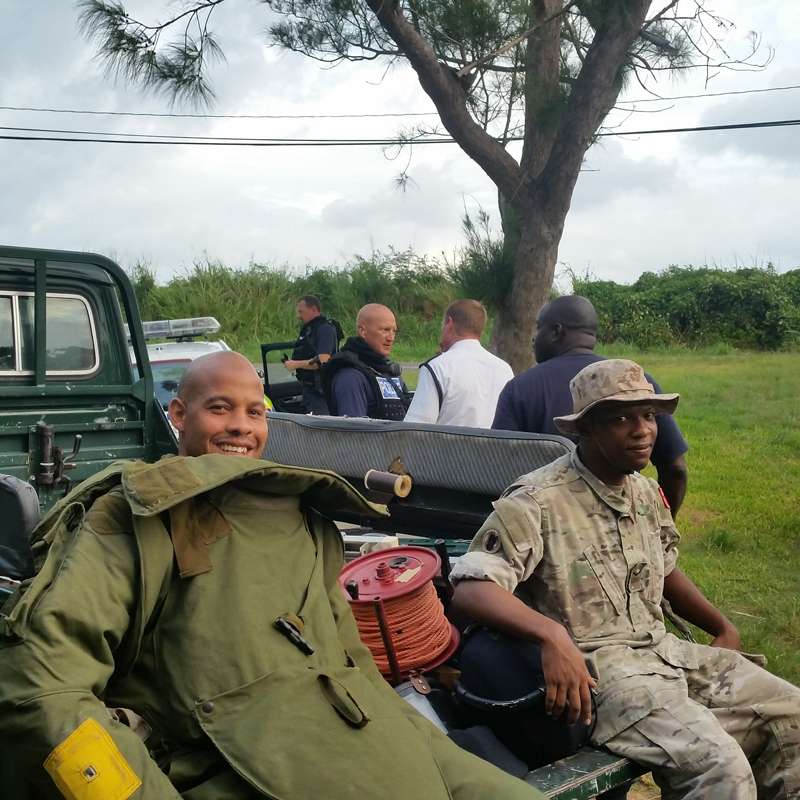 Royal Bermuda Regiment [RBR] soldiers and Bermuda Police Service officers joined forces over the weekend for a major joint exercise. Joint Venture 15 involved a hunt by both services for an escaped inmate from Westgate prison believed to have ties to a terrorist organisation. RBR Commanding Officer Lieutenant Colonel Michael Foster-Brown said: “The objective of these joint exercise procedures is to test the interoperability between key services. 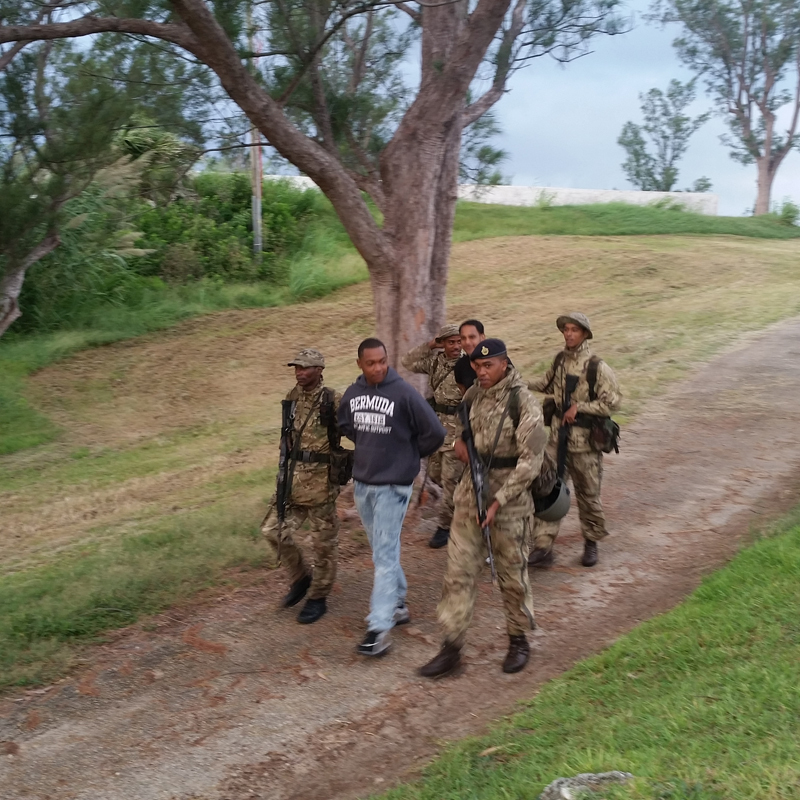 Caught: A ‘suspected terrorist’ and ‘Westgate escapee’ is captured as part of a major weekend exercise involving the Royal Bermuda Regiment and the Bermuda Police Service. “We are very pleased with the results – both teams worked together seamlessly. The scenario saw four possible locations for the Westgate ‘escapee’ who fled the prison on Saturday afternoon. 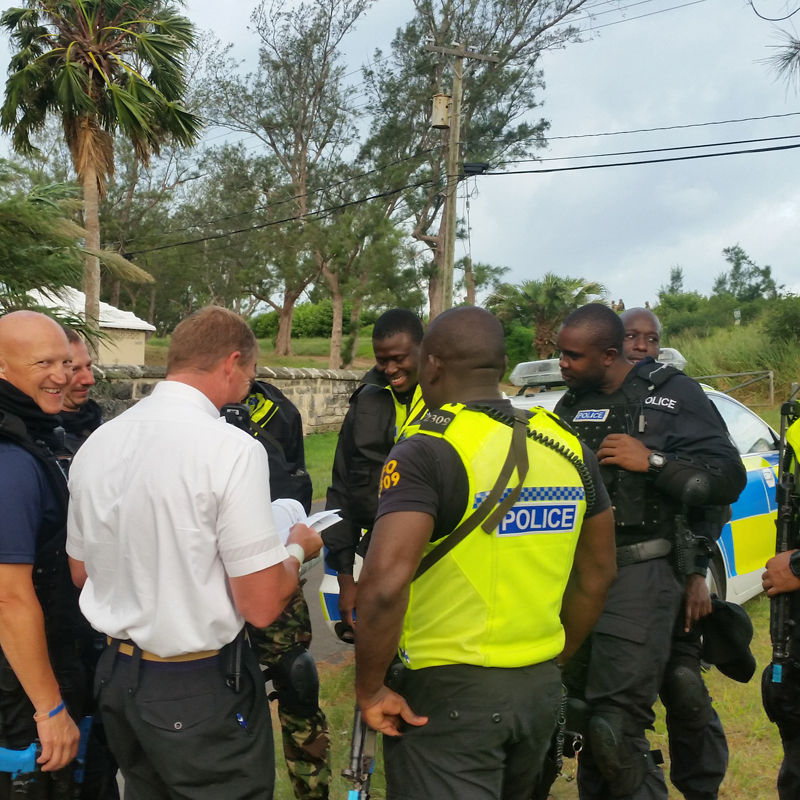 Briefing: Police officers are briefed as part of the joint police/Royal Bermuda Regiment exercise at the weekend. Threats to Government House, the Public Works Quarry and the Rubis fuel terminal, meant that these locations were guarded by troops from the RBR, while the Regiment also combed the Ferry Reach area in the hunt for the suspect and a hostage he had taken. The escaped prisoner was finally detained and the hostage freed by soldiers on Sunday – but not before specialist troop had to dismantle a suspected improvised explosive device [IED]. 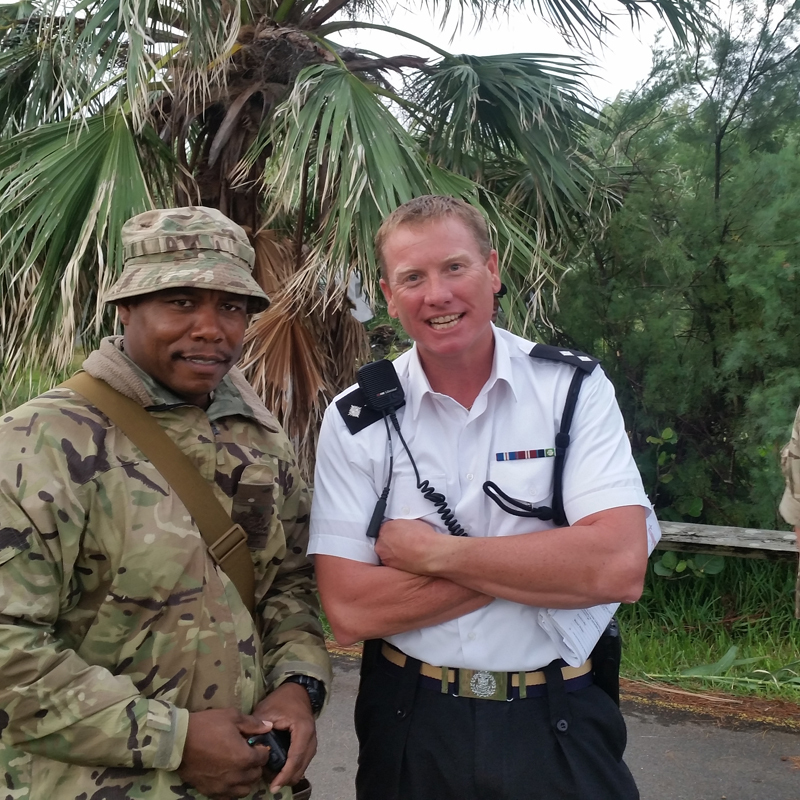 RBR Regimental Sergeant Major Gavin Rayner with Bermuda Police Service silver commander Inspector Robert Cardwell at this weekend’s joint exercise. Col Foster-Brown said that the police, led by Silver Commanders Inspector Robert Cardwell and Inspector Steve Cosham, would now conduct a formal debrief with the RBR’s Staff Officer Major Andrew Clarke and other senior RBR officers to analyse the joint responses to the exercise’s threat to security. 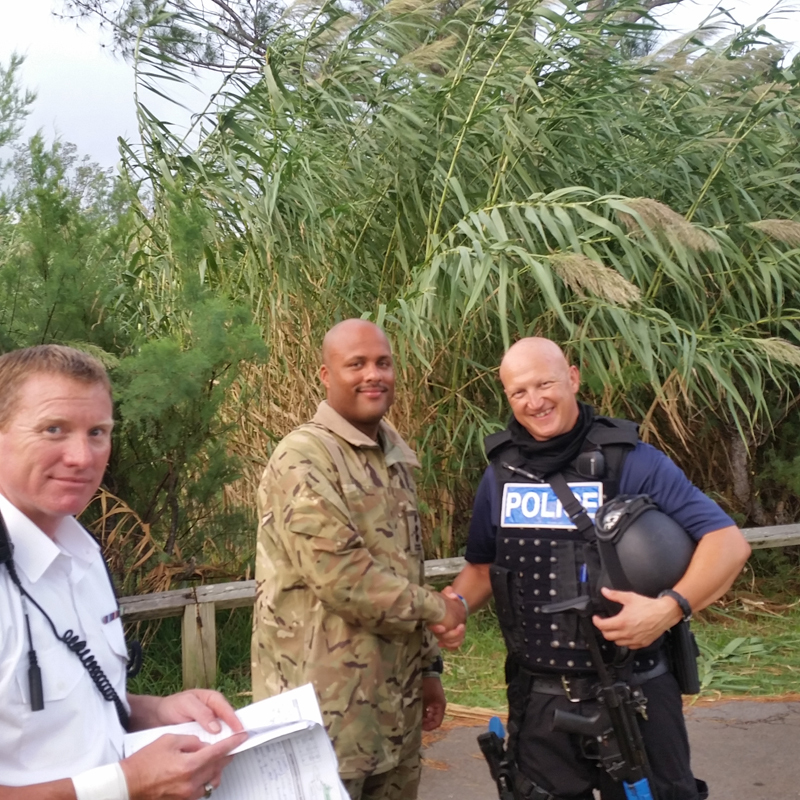 Acting Deputy Commissioner of Police Antoine Daniels said: “We have to recognise that Bermuda, unlike the UK, US and Europe, doesn’t have the major back-up they can all call upon. RBR troops take a break during the gruelling two day joint exercise involving troops and police. RBR Captain Shea Smith [centre] with Inspector Robert Cardwell [left] and a police firearms officer at this weekend’s joint exercise. Wait until the first blast. No island is immune today. Shouldve used these guys to catch de Cup Match guy !!!!!!!!! I can’t help but say you’re foolish in your thought patterns brah! WWIII has already begun…still in its infancy stage I might add…positions are being postured..ISIS for example are entering all countries under the guise of immigrant refugees…Super Powers are butting horns…All of this taking place while you are purposely distracted by and are being encouraged to start Race Wars amongst ourselves…along with many other distractions…ohhhh boy! lotta you gonna get caught wit ya pants down. Now who mentioned anything about Race Wars? You mean they didn’t inform you…?? NO, but I’m sure I will hear about it. It’s just a scenario the higher ups decided to use. Relax. Is it me, or is there an abundance of non-Bermudians present in the pictures?? Just curious as to why, because I like many other Bermudians who have applied to the Police force have been turned away for capacity reasons but continue to see them recruit overseas officers every year. What does a Bermudian look like? Do you mean, they don’t look like me? I know two of the individuals and I can assure you that while they may not look like you , they are Bermudian. Before you make such stupid statements why don’t you share your reason for being turned down? Did you not pass the physical, the educational test, the drug test, criminal background check, or the mental stability test? If you failed any of those – well tough! Study harder, get fit and put down de herb superb if it was any of these! If you have a criminal past talk to others that have had the same problem to see if you can get past that. Regarding the psychological examination, well there isn’t much you can do about that so hopefully that wasn’t it. The same utter stupidity you hear around here when people accuse others of not being Bermudian based on what they submit. The ignorance on this rock is mind blowing . Well we do now have domestic terrorism…n’youknowit!….tightenup y’jib mate! How many of you are familiar with Operation Jade Helm..? Research that then see how good you are at connecting the dots. these exercises are very inciteful and unnecessary, just as 400guns and ammunition as a gift to the regiment remains extremely suspect, lets take a look at the true picture, uhhuh aware of”jade helm”this type of behaviour by people who mare supposed to protect society is becoming prevelant around the world… I would like to know in case of an emergency what is our island wide code or warning ,if all electricity was out island wide and there was either extremem weather or other danger to society conditions what are the proceedures for people to be aware of what is happening, what exactly do we have, will fire department trucks give a warning or will regiment be giving warning shots? It would be interesting to know what is the islands warning horns , bells or whistles to alert the public of impending danger. It is disturbing to think that expression of opinion can be misconstrued as “terrorist” when terrorist are people that can actually terrorise , frighten, or scare people,..Robbers do that all the time across the island, what is being done to keep the public safe within their own homes against recent spats across the island,..we are told to be vigilant but we are not armed,.. why would bermuda need live ammunition?just asking, are we in danger or not? When every country in the civilized world is trying to demilitarize the police DeSilva decides to do the opposite, retirement on the horizon?